Playing with all kind of triangles units: half-square-triangles, half-hourglass-units and square-in-a-square-units: improve your skills with block 7 of the Zen Chic BOM sew along. 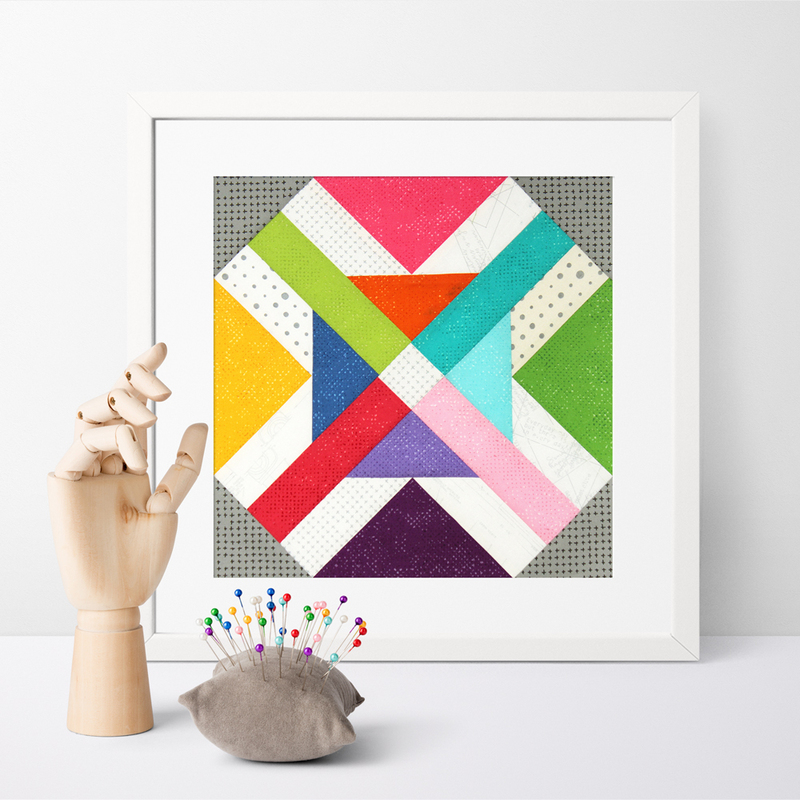 Have fun with simple straight line piecing: Block 6 of our Zen Chic BOM 2018 Sew-Along is built around a striking big plus sign in the center that is easy to sew and emphasizes the effect of color blocking with fresh bright colors. Block 5 of our Zen Chic BOM 2018 Sew-Along is more challenging: We sew a compass block with foundation paper piecing, curved seams and hand appliqué. It’s actually a skill builder block. But no worries, with the detailed tutorial on how to sew the pieced ring you can manage this modern and fresh block. 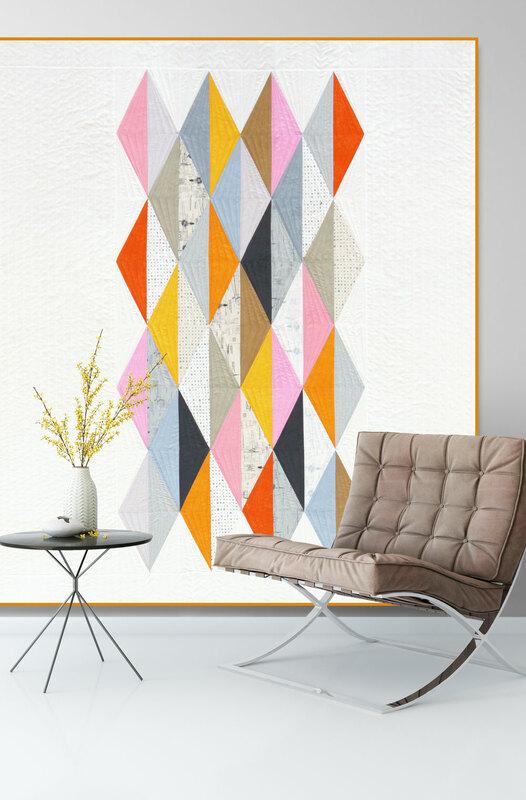 Block 4 of our Zen Chic BOM 2018 Sew-Along is an exciting mix of modern graphic elements implemented in a classical geometric block design. The arrows represent an element of our everyday life, inspired by impressions from the airport, internet or smart phone. They are made from traditional flying geese units for which you can find some useful sewing tips here in my blog. For Block 3 of our Zen Chic BOM 2018 Sew-Along I have some useful tips for you on how to sew the perfect hour glass block. See here, which practical tool I used to receive the most accurate seam line for the pointed tips in the center. Some of you are still waiting for their fabrics to arrive, so we will have a little “pause” here and bring some bonus tips in order to let the waiting people catch up with the project. Check out my playful new quilt pattern BABY BALLS made from fabrics of the SPOTTED collection, which lately arrived in stores. The size of this quilt is perfectly suited for a play rug or baby blanket and it’s a great sewing project for grandmothers-to-be, like me. We also move on with our Moda Blockheads 2018 sew along, presenting block 32. It is an easy to sew Double Quartet Quilt Block, hosted by Betsy Chutchian, who loves to create traditional quilts and antique looking fabric lines. My new collections SPOTTED and MORE PAPER are now both available in shops! We want to celebrate the sales launch with a series of four brand-new quilt patterns including different compilations of the two lines, starting with the pattern SKY this week. Furthermore we keep on working on the Moda Blockheads 2018 project with block 31, which is an unique mixture of traditional and abstract design elements, including challenging features, like a curved seam. Read more to check out, which trick I used to simplify the piecing. This week we present Block 2 of our Zen Chic BOM 2018 Sew-Along. It’s a classic pieced block, a so called Mosaic Block. I also have to announce some minor corrections to our cutting instructions after the helpful feedback of one of my very attentive clients. You can download a PDF with all revisions here in my blog.